By hungry runner on February 4th, 2010 . 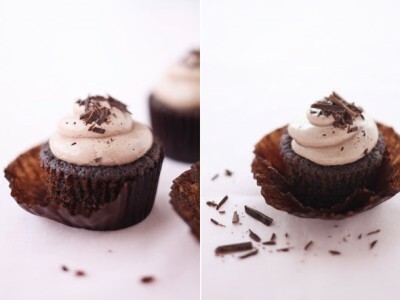 Filed under: Blogs, Cupcake Ideas, Recipes . Cannelle et Vanille is one of my favorite blogs, the food and pictures combine to make amazing recipes. 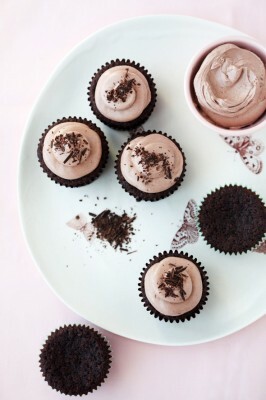 Recently she made Chocolate, Banana, and Teff Cupcakes. According to her these cupcakes are not only delicious but also packed full of nutrients provided by the Teff and bananas. Additionaly, the cupcakes are gluten free because Teff is used. Teff is a grass that is cultivated in Northeast Africa. The grass contains various nutrients including fiber, iron, protein, and calcium. In a medium bowl, whisk together the eggs, sugar, banana puree, oil and vanilla. In a large bowl, whisk together the teff, sweet rice flour, hazelnut meal, cocoa powder, salt, baking soda. Add the wet ingredients to the dry and whisk until all combined. Fold in the chocolate chips. Divide the batter between the loaf pan and cupcake molds. Bake at 350F for about 45 minutes for the loaf pan and 20 minutes for the cupcakes. For the icing, I used my basic buttercream recipe and added cocoa powder to it. « NerdCake of the Week: Brain Slug Cupcakes!